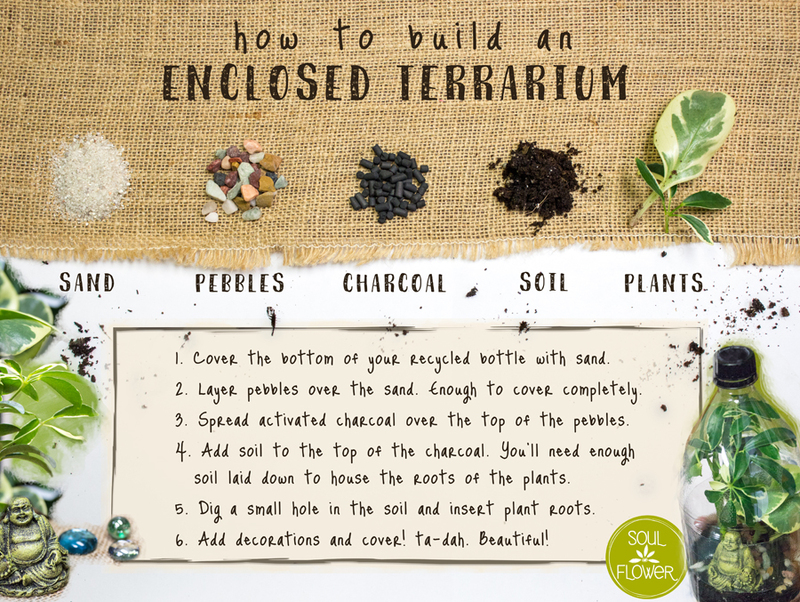 It’s no secret that terrariums are gaining popularity. And why wouldn’t they? These “mini greenhouses” of sorts are adorable, low maintenance, and the perfect way to green up indoor spaces. We love our plants (we are your buds you know!) and we have a lot of indoor plants in our offices. 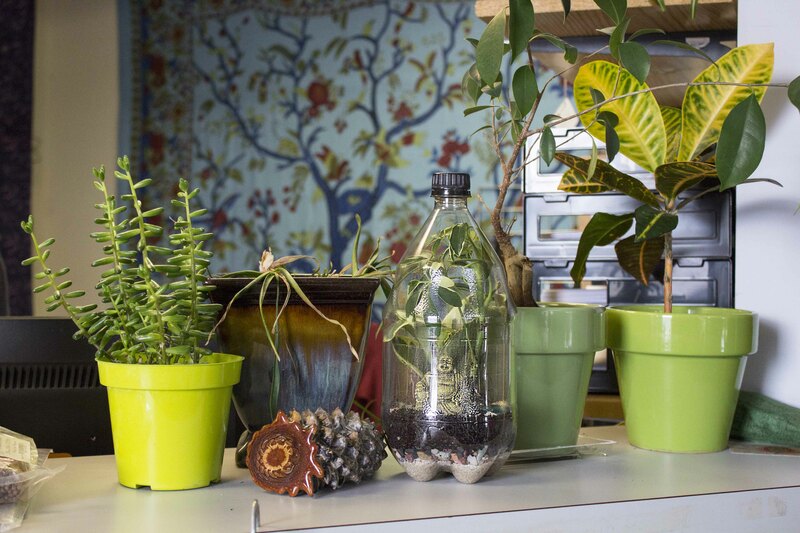 So we thought – why not find a way to bring our two worlds together: house plants and recycling! 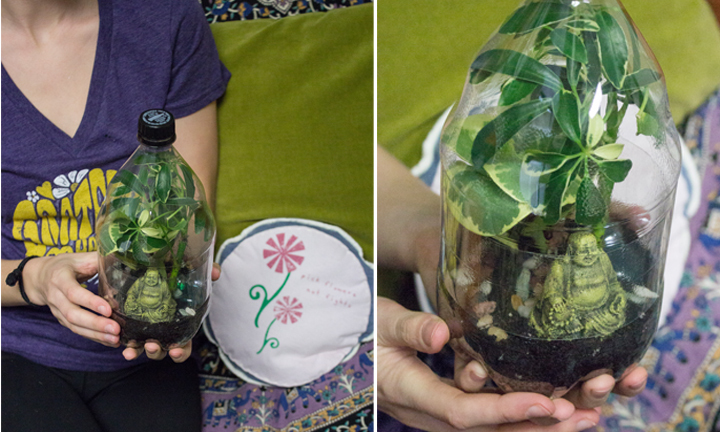 We’ve taken the classic enclosed terrarium and “greened it up” even more by reusing an empty 2 liter soda bottle for the container: a simple plastic bottle terrrarium! 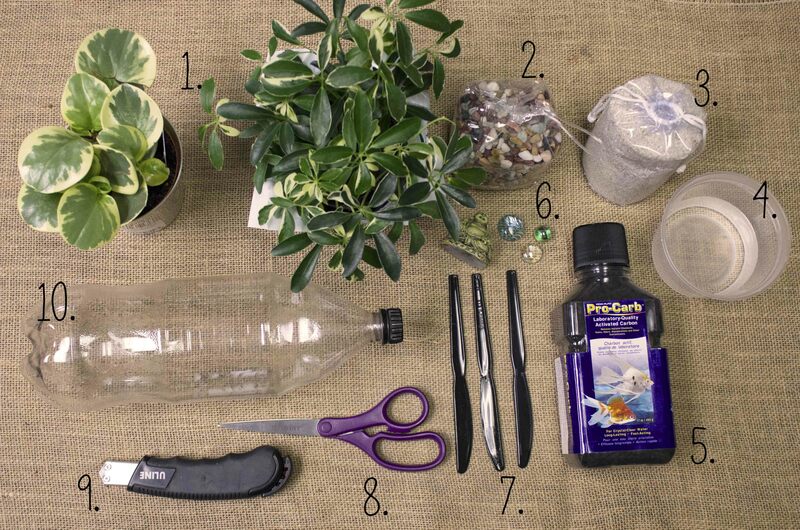 Read on to learn how to create your own soda bottle terrarium and create a mini organic (and recycled!) space for your plants. What plants are best for your terrarium? Select humidity-loving plants such as the ones we used, the Umbrella Plant, and Peperomia, which has many different variations. These plants thrive in an sealed enclosure and will create their own mini eco-system! It’s always a good idea to use nutrient-rich, organic soil. 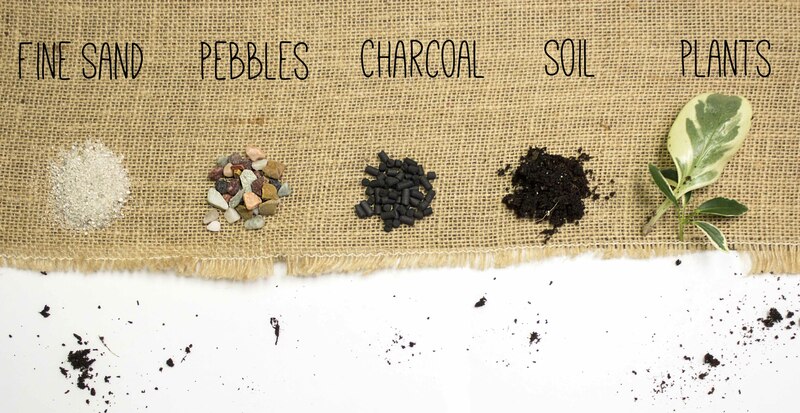 In addition to your soil, it’s important to use fine sand, pebbles, and activated charcoal so that your plants are able to absorb only as much water as needed and to prevent mold/mildew from growing inside of your terrarium. 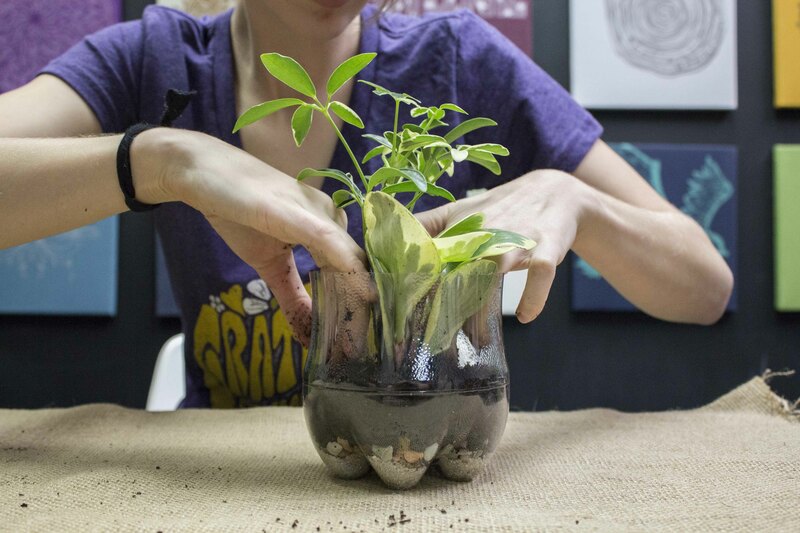 Choosing the right plants and soil will ensure that your mini eco-system thrives and requires minimal care/watering. 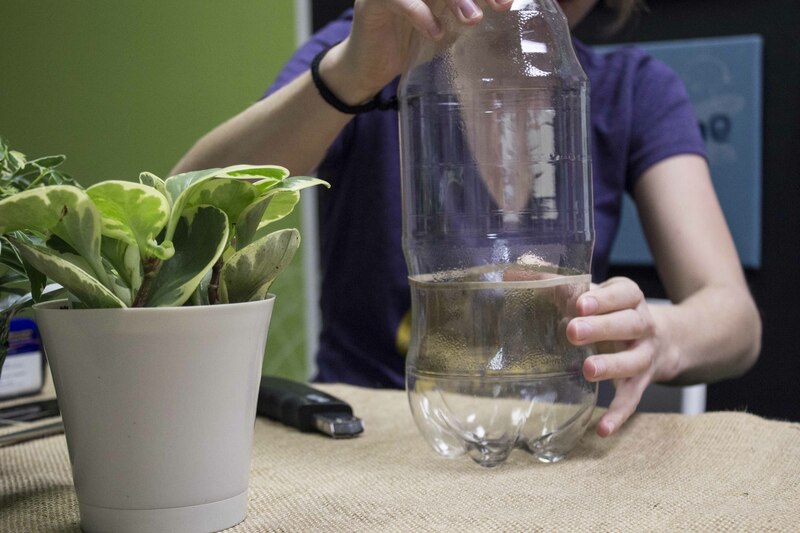 Step 1: Place a rubber band around your empty, clean soda bottle. 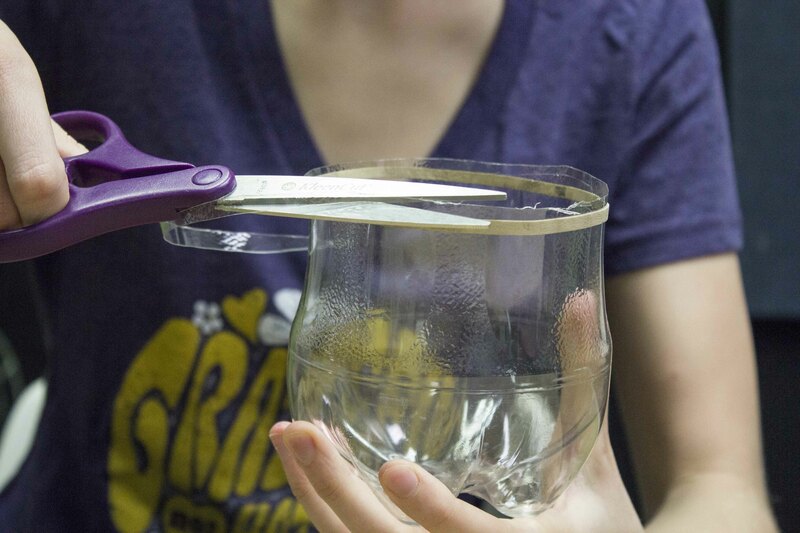 You’ll want the rubber band to be as level as possible, and to sit just below where the bottle begins to flare outwards. This is where you’ll cut your bottle. Step 2: Cut just above the rubber band. 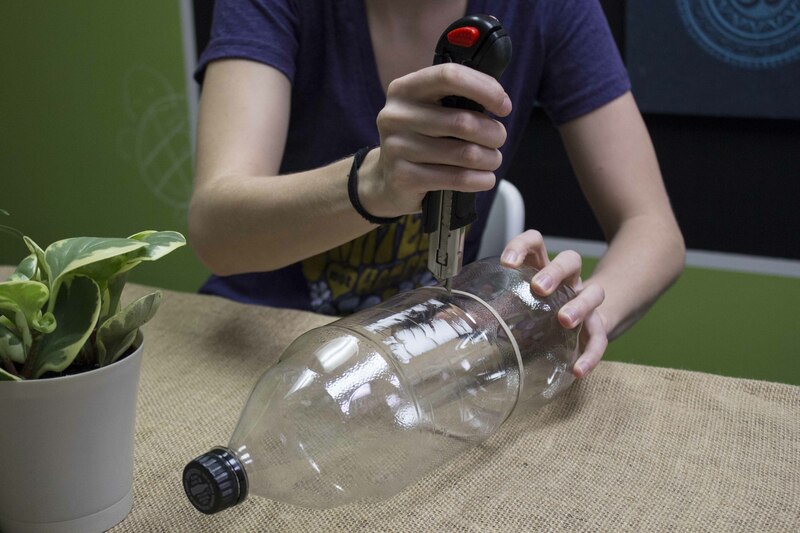 Use a box cutter to “stab” a hole in the bottle, then use a scissors to cut the rest of the way around. Trim about 1″ off the bottom of the top half of the bottom as well. 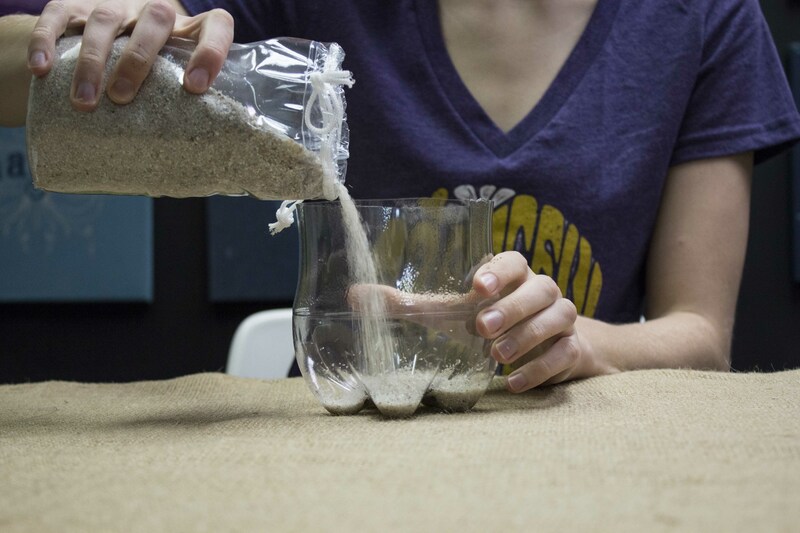 Step 3: Pour 1/2″ sand into the bottom. Step 4: Add a layer of pebbles. 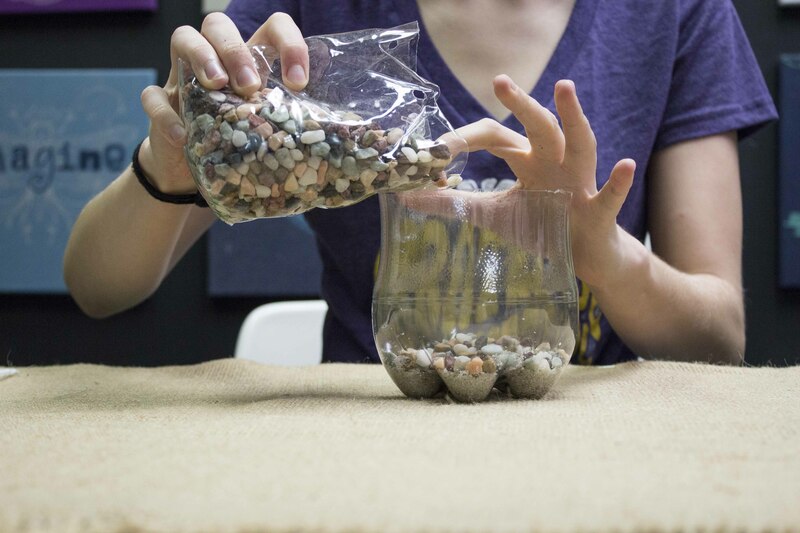 The sand and pebbles will help with water drainage, ensuring that your plants don’t become water-logged. Step 5: Add the activated charcoal. 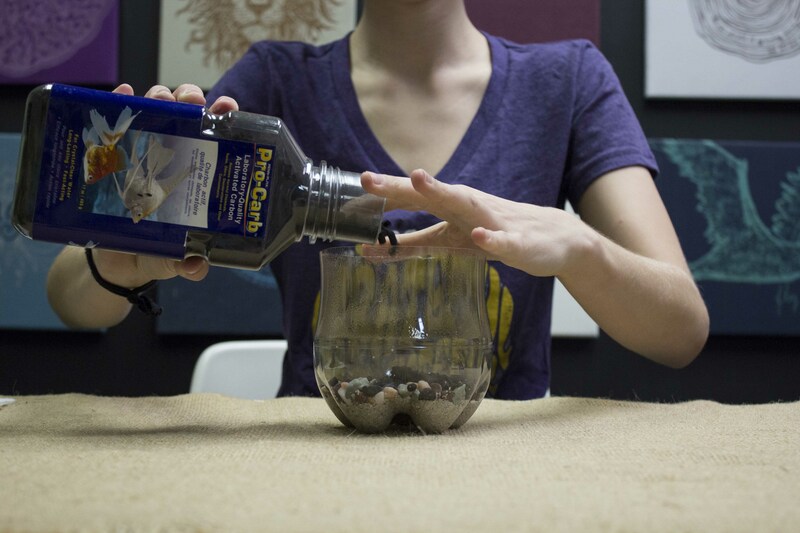 Activated charcoal (which can be found at many pet, craft, and gardening stores) helps in preventing mold and mildew from growing inside your terrarium. 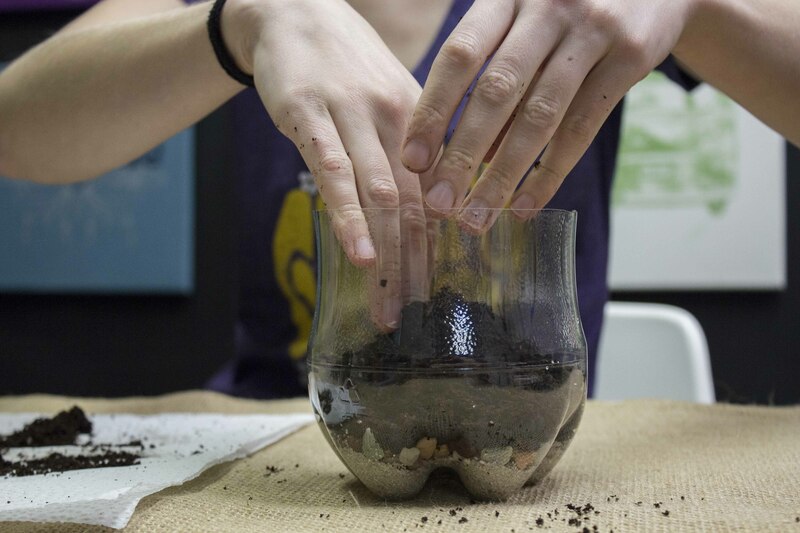 Step 6: Add a 2-3″ layer of organic soil. Poke holes in the soil where you want to put your plants. Why Organic? Because we love Mother Earth and want to keep thing eco-friendly and organic whenever we can. 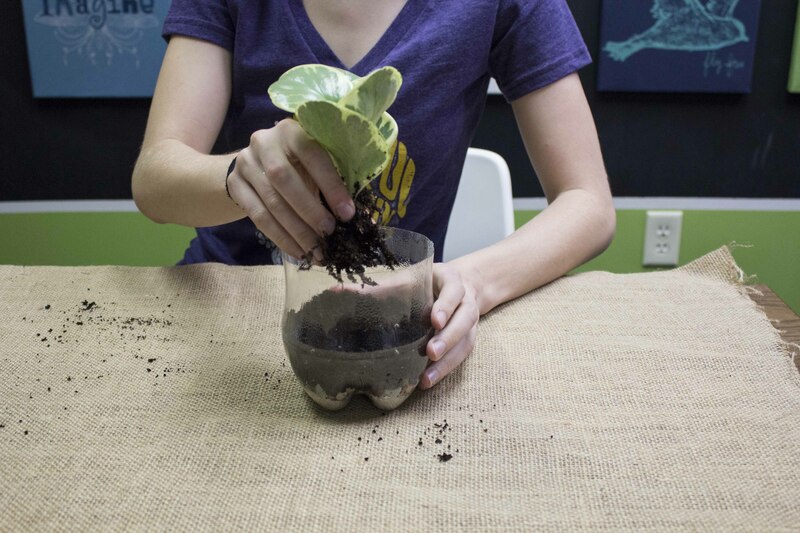 Step 7: Cut apart plants using a small knife or garden shovel and insert into the holes in your soil. Add a bit of water to allow the plants to settle into their new home! Step 8: Add decorations (crystals, glass beads, miniature statues, etc.) 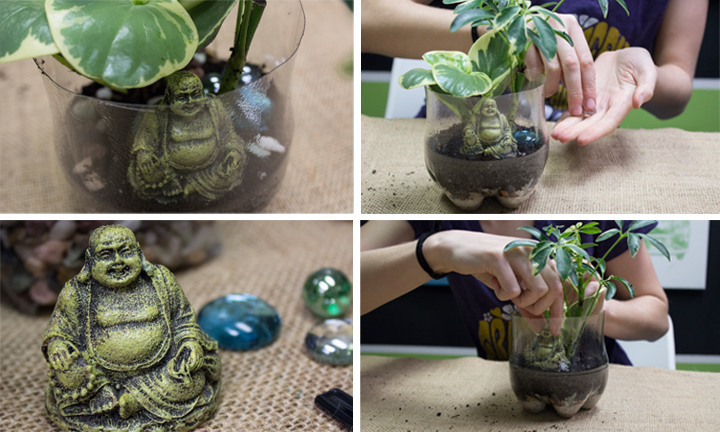 to adorn your plastic bottle terrarium. Add extra pebbles around your decorations to top it off! Step 9: Slide your lid over the top of the terrarium base. Step 10: Hooray! You’re done! 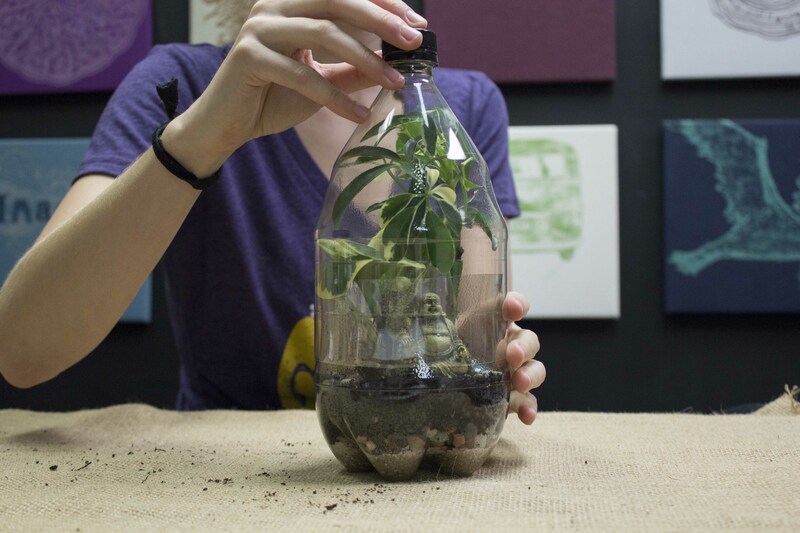 Be sure to place your plastic bottle terrarium in a place where it receives plenty of indirect sunlight and to mist/water it every other week or so. And below is a set of printable instructions. 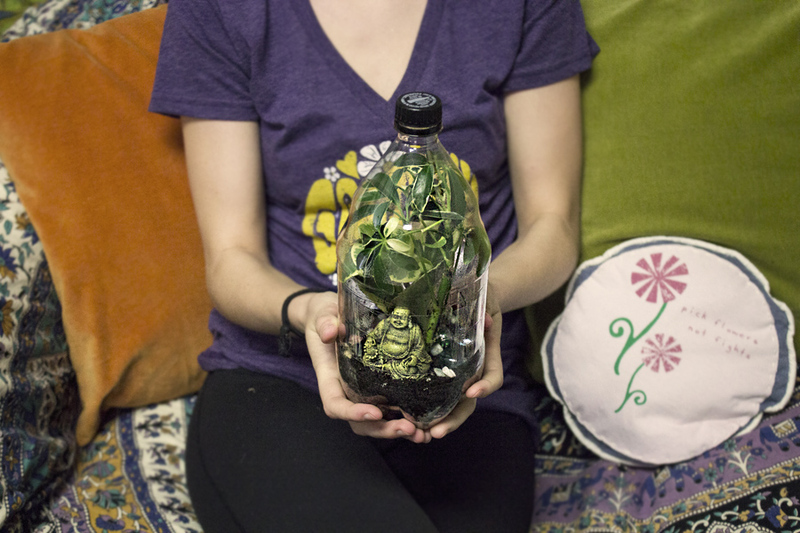 Have fun creating your own recycled plastic bottle terrarium, buds and thanks for keeping mother earth in mind by recycling and buying organic always! 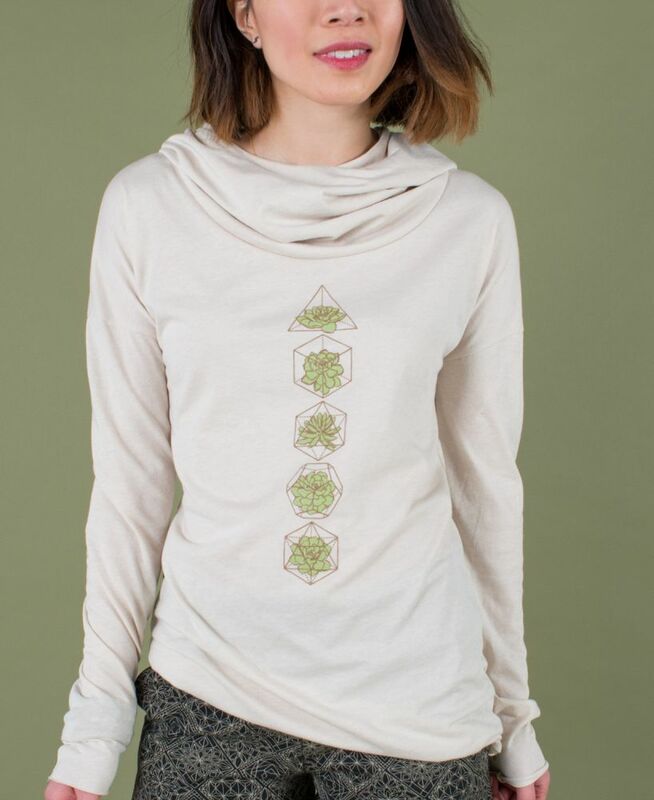 Learn more about Soul Flower and our commitment to recycled, organic cotton clothing. where do i buy activated charcoal? or what happen if i don’t put charcoal?